Although the way we communicate has changed considerably in the last twenty years, good writing is timeless. Sometimes writing is so good you don’t even know it’s good – it’s just there, seemingly having poured out of the author. This is no accident and can take years to achieve. But we don’t have years! Add to that, you’re often competing against paid professionals – content marketers – who make their living ghost writing for business execs. How is little ol’ you – with a career, family, and a million other responsibilities, swimming in a sea of, literally, a billion blogs – supposed to compete, let alone stand out? Fear not. Help is on the way! I put together this article on writing a blog post, an article – whatever you want to call it in 2019 – to help you drop the learning curve, and, give you an inside peak as to what goes into creating an impactful article that yes, just might appear effortless. None of this is as fun as just letting it rip, or winging it, and some might even call it "work," but I believe it to be a necessary process that will, potentially, generate content ideas for you well into 2021. So, yes, while this article is dense, but it will give you the aforementioned "process" along with lots of cues and tips on what to do and think about in order to squeeze the most out of an important touch point with your target audience. A touch point that will further establish your personal brand, and you as a subject matter authority. Before you put fingers to keyboard, I urge you to do a few things that won’t be fun, but, in the end, will make your article more effective and cut down on the time it takes to complete. In fact, this is where most of the heavy lifting is done. Do the work here, and in this order, and the proverbial dominoes start falling, setting you up for immediate and long-term “on brand” content generation. 1) Know your target audience. If you read my first piece, I went on and on about the importance of knowing your target audience. So, hopefully, by now you’ve done your target audience/buyer persona worksheet. If you’re too engrossed in this article to click that link, profile at least three of your customers (ten would be ideal), noting everything about them. Start with the general – demographics, seniority level – and then get more granular – a day in the life, and pain points and objections to your service offerings. Be as specific as possible. You should start to see trends emerge. This will help form your target audience profile(s). It’s okay to have more than one persona amongst your clients and prospects. Your target audience will dictate almost all of your content decisions going forward so when you have that down, the answers to almost all of your content questions – What do I write about? Should I include this bullet? Should I share this? – will become clear. So, to think about it another way, your target audience is your Why – why are you creating what you are creating? While the target audience prism may make your writing experience feel more constrained, it will make your content focused and ensure that you’re providing value to your readership. Your target audience profile is the bedrock of your content strategy. Additionally, I find that when I’m stuck and remind myself of my audience, I magically recall (maybe, it’s my subconscious working, but whatever it is, I’ll take it!) certain tips and strategies that I might have normally cast aside as “too obvious” or “a given.” But it’s often these tips that will round out your article, taking it from good to great. Long story, short, review your target audience persona sheet before starting a new article to remind yourself who you are writing for. 2) Brainstorm. The age old question: What should I write about? Coming up with original content and writing an article or more per month is a daunting task. Throw in the need to make all of your content flow with a thematic throughline that ties all of your work together, and you can see how your grand plans can unravel fast. However, there’s an easier way. Because you know your target audience, and because the whole purpose of creating your content is to serve them (how tired are you of hearing me say that?! ), that’s all we have to focus on. List all of the complaints, obstacles, and questions you hear from your target audience and write about that. This list will serve as your list of topics for the articles you are going to write. But, if you’re like me, you like to pull ideas apart in every which way with the hopes of unearthing something different than your competitors. Here are eight questions to ask yourself about your target audience to help build out your list of article topics. What makes their job harder? What does their boss care about? What are situations that you have seen blindside your audience because they weren’t prepared? Think about what you continually see as the barriers for your target audience’s success at their job. To frame it another way, ask yourself what you would wish YOU knew if you were doing THEIR job? Where does your competition fall short? This is a delicate balance. Don’t bash your competition, but also make your particular value add clear. One way to do it: Set up a familiar situation and then illustrate how you help, while also pointing out how your unnamed competitors drop the ball. What are their objections to hiring you? Overcome these objections in your writing. What is some insider knowledge that you can share? Some people may refer to this as “Inside baseball” – where an industry professional peels back a layer of the more esoteric inner workings of a business. Note: while these posts are usually either very popular or complete duds, I’d wait until you built up a solid rapport with your readership before posting one of them. By now you should have about 8 different lists. Lay them all out. Delete the redundancies, combine the tangential and overly similar (some of these may become subtopics), and put aside ideas that, right now, may seem “off brand” or not thematically relevant. If you take a step back and look at your combined lists, most likely, you’ll notice something that should provide some relief, quelling any fears of writer’s block: a long list of topics. To put it in perspective, since you’re only writing one article a month, if you have 24 topics – that’s two years’ worth of thematically related content you now have ready to create. Obviously, industries evolve, trends emerge, and you may notice that your audience is particular to certain topics, so I’d do this exercise every six months, but still, it’s a relief to know that you may just have two years of fresh content mapped out. 3) Research SEO. To me, this is the least fun thing to do, but when done right, it can expedite your climb up the search rankings. The problem is, doing it right is a job unto itself. But, if you’re not going to pay anyone and you’re aiming to grow organically (i.e. not “paid search”), there a few things that will give you good ROI on your time. The easiest way to jumpstart this is to find what your competitors are ranking for. Google Keyword Planner and Ubersuggest are good tools for that. If you want to take a bigger dive, Neil Patel wrote an excellent article on ranking for the right SEO words. Meta description. On your website, make sure your meta description (the part that shows up in the Google results description) contains the right keywords. And your page title and headings should be accurate, but it helps if they’re a keyword too. For example, at a recent SEO marketing lecture I attended, the presenter, Brandon Leibowitz, owner of SEO Optimizers, noted how in Los Angeles, “SEO Agency” yielded more than four times as many searches per month than “SEO Company”. Obviously, you’re going to want to describe your business as an SEO Agency. Two more things to keep in mind in regards to SEO. Original Content. Google search engine rewards original content. And, it helps when that content contains some longtail keywords related to what you do. Google is always changing its SEO methods, but in general, when writing your articles if you bullet out your tips, you’re more likely to appear in the featured snippets area (the part that contains the most searched for questions related to your search topic with dropdowns that contain the answers) on Google’s first page. Backlinks. I saved the best for last. A backlink is when your website or a page on your website is linked to by another website. Why would someone backlink to you? Because your content is providing value to their audience. The easiest way to do this is to guest blog (or guest posting). If you can get two backlinks a month, you’re doing okay. If you can get five, you’re a rockstar. And, if you can get backlinks on big sites like Huffington Post, or niche industry websites – this helps proportionately more than a small website with fewer followers. Ahrefs backlink checker is a great tool to see what web pages are linking to your competition. Hint: you might want to introduce yourself to the owners of those web pages. A word about…Word count. Currently the length of the ideal blog post is 1,890 words. While this is helpful intel, don’t get too hung up on it. Consistently putting out good content is the most important thing to do, especially if you’re just starting out. And, whatever you do, please don’t pad your words. 4) The Checklist Outline. All right, now that you’ve done all of the hard work – you’re ready to write! Not so fast. While some may call this an outline, I actually think about it as a checklist first then that checklist is massaged into an Outline. Writing is structure. When you nail the structure, which is borne from your Outline – at the worst – you should have a cogent piece. You already have your throughline/theme, topics, and maybe even a couple of subtopics from your brainstorming session in Section 2. Essentially, you’ve laid out your argument, now how are you going to frame it and then support it? From here, I urge you to take 10 minutes and list what you want to emphasize and accomplish with your article – the salient points, the takeaways, the info that your target audience needs to know to do their job better. I often start by asking myself: What needs to be here (to support my topic/argument)? Then, rearrange that list in an order that makes sense to you, so it flows logically. When rearranging, an easy way to think about it is to place the purpose of your article at the top (like a title), put your supporting ideas below and within each supporting idea, bullet out the main points you have to hit to both support your subtopic and provide the tangible value to your target audience in order to drive your message home. One more way to tackle structure. You can even use the case study format as a way to organize your thoughts within the respective subtopics in your piece. But maybe the best thing about using this tool is that it naturally provides a narrative (story) structure to your writing, making it more accessible. So, you’ve done the hard work, you’ve laid out what you want to say, now write your piece. Personally, I write out of order. Knocking off the subtopics that I can best speak to first. When I’m writing about these topics, I’m trying to support and/or prove my point(s) via my writing by giving context, points, counterpoints, and facts when necessary. At this stage, let it rip. Write whatever pops into your head and don’t look back. You’re the expert. Don’t be afraid to let your gut instincts guide you. You never know what you may have stored away in that brain of yours. And, please don’t censor yourself (easier said than done!). We’re just trying to get it all out there on the page. You're going to have to rewrite and proofread anyway. But that's a whole other post. There is a tremendous amount of content out there. You’re fighting for clicks, eyeballs, and attention. It may not always be easy or fun, but by defining your target audience and then consistently making decisions that create content that provides value to that audience, you’ll stand out from your competition, become a trusted resource, and build your personal brand along the way. In the first half of 2018, Ted Simpson, a commercial real estate broker, and I launched a branded LinkedIn article campaign to elevate Ted’s online presence and build his personal brand by further positioning him as a thought leader in the commercial real estate space. What follows is a culmination of my takeaways from that experience, as well as my notes from both my internet research and conversations with vendors who make their money providing content for individuals and corporations. I then took all of this material, did some more reflection, and codified my findings into 10 actionable steps that will help anyone - in any industry - build their own unique personal brand in their respective professional world. I did this more so I wouldn't make the same mistakes twice, but figured I'd save everyone some time in the process. What a guy! Lastly, if, after reading this whole thing, you're still wondering how to make this work for you, hit me up and we’ll figure it out. So, it’s 2019, everyone is online, everyone and their grandmother has a social media presence, and you’re wondering if you should too. After all, your main goal as a commercial real estate broker isn’t to trend on Twitter, but rather to help your clients, close deals, and be financially rewarded. How does a personal brand help you with that? The idea behind building a personal brand is that, if you do it the right way, you become seen as a thought leader and an authority in your particular line of expertise, and you will be the person people turn to when they need X (insert expertise here). Additionally, in today’s one-click, “I want it now” environment, the way people are communicating, searching for office space, and finding brokers is expanding. The key is to be where your prospect (i.e. target audience) searches, and this is often at the top of a Google search. A well-executed branding plan can help you here too. First things first. Building a personal brand on the internet that will realize a ROI is a lot of work. There’s a ton of competition, along with a lot of “noise” out there that you’ll be trying to break through. It’s not uncommon for executives at Fortune 500 companies to hire outside vendors to do their content for them (yes, many of those LinkedIn articles written by your favorite business mind were not written by that person). Or for other executives to pay to be a part of something like Forbes Councils, where your money gets your articles published under the Forbes.com banner. Consistently delivering (ideally) original high quality content that provides value to your target audience – think of it as leaving them with a takeaway – in your respective niche is key. In fact, I’d argue that it’s the only way to really derive any value from becoming a one-man-brand. Otherwise, you’d be better off focusing your efforts on other avenues of business development. Luckily, “consistently” when it comes to writing and posting LinkedIn articles is – at most – two articles per month, but the current wisdom is that you can get away with just one. In between these article postings, you’re sharing relevant content (typically: articles, listicles, stats/infographics, and videos) on LinkedIn and Twitter around two to three times a week. 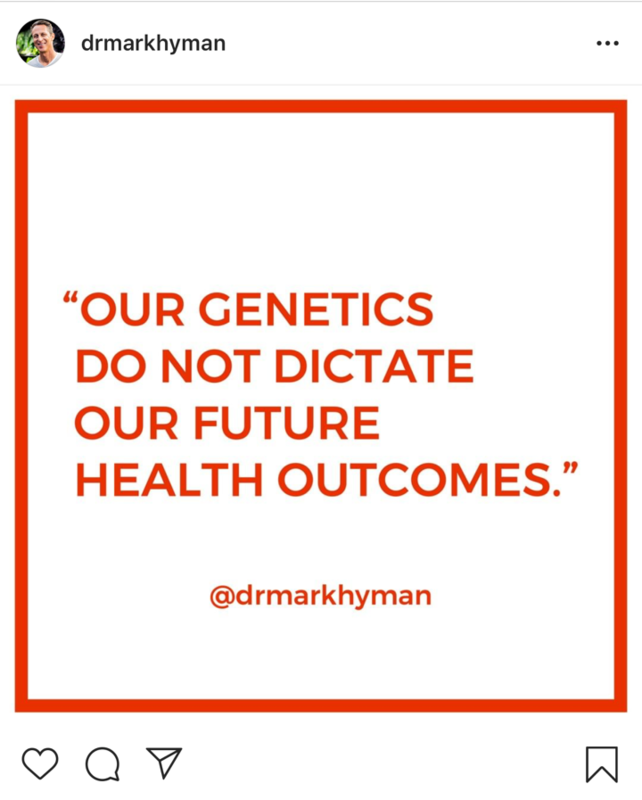 Additionally, once you have a few articles, you can start quoting yourself (see below example for @drmarkhyman) from your old articles, including a link back to that respective article. Repurposing your content is a great way to squeeze more value out of your initial hard work of writing an article. When writing your content, I’d recommend finding no more than three topics you want to be known for that will appeal to your target audience. Your goal is to become known as an authority and thought leader for those specific topics. Any more than three ideas, you’re diluting your brand and the ability of your audience to remember you for “X.” In other words, you want to be known as the BLANK guy. Someone searches your name into Google and immediately gets the sense you’re actively pushing the boundaries of your industry. Or, at a minimum, you’re someone who really understands the “pain” of their audience (and, therefore, logically, can solve their problem). Another way to frame it is to think about positioning yourself as a helpful expert (i.e. an authority). One way to do that is to start by listing the most common questions you hear from your clients and prospects, and then answering them in your content. Lastly, people respect the grind of consistently putting out original content, and search engines reward this persistence as well. Whatever your inner motivation may be, from the outside, the way you will be perceived will be that of an authority and thought leader, and someone for whom this isn’t just another job. For Ted’s articles, we chose to focus on the key proposal and lease terms (TI’s, ROFO, etc. ), and branched a little further out to include tips on the process of searching for new office space – all this from a very “Us vs. them (the landlord),” point of view. We did this in order to position Ted as an authority and a resource on proposals and leases for people looking for office space. Diving a little deeper, in marketing speak, we created content pillars and brand guidelines used to define the broker's "voice," as well as visual assets. This unified approach helped give the articles a throughline both thematically and visually and helped further establish Ted’s brand. Because we wanted to separate Ted from the same old dry corporate jargon, and to grab the LinkedIn scroller’s attention, tonally, we went for something more fun, titling the series “WOKE: Ted’s Tips From The Real Estate Trenches.” Making the title of each piece something closer to a New York Post headline than a boring press release worked for our brand goals. Finally, we tried to make the articles relatable, putting ourselves, as best we could, in the position of a would-be office occupier reading the piece (his target audience). We also plan on repurposing the article series by combining them into a book and either 1) self-publishing and selling on Amazon or 2) distributing for free to various email lists. A book will also further position Ted as a resource and thought leader in his space. Additionally, we can use the articles as material for YouTube videos, but more on that in a minute. 1. Your picture/headshot should be consistent across all social platforms that you use for business. Additionally, take advantage of the banner/cover pics (the big background pic) on LinkedIn and Twitter if possible. For example, on Ted’s Twitter we used a pic of him speaking/moderating a panel at a conference. This obviously helps establish social proof, authenticity, and authority. 2. Work on your LinkedIn headline to include what you actually do (i.e. make sure it doesn’t just say Real Estate Broker or Vice President) as these will act as keywords in searches. 3. LinkedIn Bio. Write a bio (even if it’s just one paragraph) and then bullet out the things you want to be known for (office leasing, building sales, etc.). Don’t be afraid to add links to articles, press, and other media here. They will be clickable and will help tell your story. Post tombstones/one-sheets that celebrate a recent deal you did, use relevant hashtags and post on LinkedIn, Twitter, and send to your curated email list. You can also work with your marketing or PR team to write a simple press release on the deal. Get a quote from the client. Quote yourself. Have the press release published to the company website. Share that link. 5. BONUS: Curate and share content on industry related topics and trends that you want to be known for. Add a few words to give what you’re sharing context and how it might relate to your audience. Below are 10 actionable steps to building your online brand. Once you set your base in steps one through four, creating a formalized workflow in steps five through ten will ensure that you squeeze the most out of your content efforts and avoid common content inefficiencies. 1. Evaluate your digital footprint. Enact the first three “Easy To Enact Branding Tips” from the previous section immediately. 2. Pick two-three topics for you to “own” in your space. Set Google alerts for those topics. 3. Define your target audience and be where they hang out. Then, take a step back and map out your target audience’s purchase cycle. Where are the opportunities for you to help along the way with the content that you’re creating? TIP: Earlier, I linked to a “target audience persona” worksheet, if you don’t feel like doing that, at the very least think about who they are professionally and their biggest problems at work. Better yet, what does their boss care about? 4. Create brand guidelines used to define the broker’s voice as well as the visual assets. These are known as your brand standards. The more specific the better. TIP: I’m no graphics wizard, but programs like Adobe Spark and Canva make it easy to achieve a consistent professional brand aesthetic. 5. Write an article that adds value for your target audience. TIP1: Ideally, you “write like you talk” to give your work a voice and to avoid stuffy corporate speak, making your articles more accessible in the process. TIP2: Keep the fancy words to yourself and write for everyone. TIP3: If you want to go a little into the SEO keywords weeds, read this and check out Google Trends, Text Optimizer to start. TIP4: List the most common questions and problems you hear from your target audience, and then answer them in your content. Use this list as topics for articles that you will write. This goes a long way in alleviating writers block! 6. Post said article to LinkedIn, Medium (if you decide to join), and share on Twitter or whatever social media platforms that your target audience will find you on. This can be the only article you post this month. Although, when ramping up, I might go with two articles a month for the first couple of months to get people to take notice. And, don’t be afraid to pitch these articles to organizations like ULI or CoreNet, or other websites/blogs related to your topic. Everyone loves free content. TIP1: Consider getting a personal website that will be a repository for all of your content. Include an email opt-in page for the email list you’re building. You might hear this website referred to as a content destination in marketing circles. TIP2: Start building your email and text list to distribute your content to. TIP3: Set up a content calendar reminding you what you’re going to post on what day and helping you adhere to your deadlines. 7. Post and/or share relevant industry content about three times per week. TIP1: Stay on brand. This is important. After you hone your topic(s), generally, don’t go re-posting or sharing Bill Gates’ article opining about AI, unless AI is part of your niche. Remember, you are now a brand. Your mission is to add value to your audience’s understanding of your particular area of expertise in real estate, not to opine on non-related topics. Obviously, things that humanize you, like charitable endeavors are okay to post. TIP2: Give context when you share something that will help your audience understand why you are sharing, or how it will affect them, their industry, etc. 8. Become an active participant in the social media game. Engage with followers, especially those who comment on your article, etc. Additionally, retweet, share, comment, follow and engage with like-minded users as well as people you find influential in your niche. 9. Nobody reads. Consider starting a YouTube channel and making videos. You can use your phone and re-hash one of your articles. It’s becoming increasingly hard to rank in Google results for text-based content, however a video, can move you right up there. Fun fact: YouTube is the second most used search engine after Google. TIP1: Voice search is becoming increasingly common. Remember this when creating titles for your articles as well as videos. TIP2: The videos don’t have to be commercial quality. In fact, I’d recommend either going rather lo-fi (shoot on your iPhone, maybe consider attaching a mic to your iPhone for better audio) or a high-end nicely polished video which is hard to duplicate pretty much anywhere in the world, except for the Los Angeles area where everyone seems to have top of the line equipment. Helpful DIY video tips. TIP1: Pulling an interesting quote or fact from a prior article, throw it on the template you designed in Adobe Spark or Canva and post to your chosen social media platforms with a link to the respective article. TIP2: Pulling your articles together (which, if you did things right, should have a theme), massage a little, and create a book. Self-publish on Amazon. TIP3: If you write an Evergreen article, dust if off about once a year, make sure the facts and figures are up-to-date, maybe refresh the creative (if there is any) and republish. TIP4: If you wrote a very long article or an eBook, split the content into multiple excerpts. In each excerpt include links to original piece of content. We have to remind ourselves of our original objective and that was becoming perceived as a thought leader. This isn’t done in a vacuum so getting Ted out there had to happen. However, you want a definitive bottom line number, right? From my experience, unfortunately, this can be tough in content marketing as (assuming your work is good quality) your “luck” seems to increase with the longer you do it and how consistently you do it. My guess is that this both builds trust with your audience as well as helps you rank higher in search results. Whether it’s a publication contacting you for an interview or a startup CEO in need of your services coming across your work while Googling – neither of those happen without your new-found digital presence. Also, while playing in your familiar sandbox of LinkedIn is a great way to start, I’d say expanding beyond your friends, family and LinkedIn connections circle is key. For better or worse, these people often have a certain perception of you (e.g. Lebron James is still “Dad” to his kids), but once you venture outside your immediate circles you have an untapped audience often seeking the information you’re providing. This is why I recommend posting your articles to sites like Medium and pitching your content to industry specific magazines and blogs. Getting back to that ROI question. Although, Ted and I enjoyed creating helpful content (and that little rush of validation when someone liked, commented on or shared an article is rewarding), with our limited resources, it’s hard to determine a true ROI on this approach because, often in content marketing, there’s no sales funnel. When I asked outside vendors about direct results, they point to some figures and rehash anecdotes, but for my money, it’s still more of a correlation than a causation, and something that is easier to measure for consumer brands interested in marking their place in the sandbox, or lifestyle gurus (e.g. Tim Ferriss) than a real estate broker. This isn’t to say that you can’t set up a sales funnel, but that’s a whole other phase of content marketing strategy, and another article. In summation, the ROI is low in the beginning, and is (possibly) only realized by moving beyond your digital sandbox, and consistently appearing in your target audience’s respective social media feeds with worthwhile information. I do believe endeavors like authoring a book (and then promoting it!) or creating a YouTube video series can provide a much quicker jolt to your “luck,” however. Regardless, there’s still no real conversion method in many of these cases. I would still improve my digital footprint and execute on the above ideas as it is just sound business practice in the age of Google, but I would take the whole process one step further and try to grab emails, and even cell phone numbers for texting, any which way I could, and then, with their permission, send them my original content on a regular, scheduled basis. On top of that, consider doing an aggregated list of pertinent content once a month (e.g. Top 10 List). A service like Mailchimp, makes this easy for emails. Yes, you have that right. Despite all of the bells and whistles we have these days, email is probably more relevant and effective than ever. And, anecdotally, I’m finding that people are responding better to text messages than email, but this is harder to track. Obviously, this is because people live on their phones these days, text messages are easier to access, and perhaps text messages imply a greater sense of urgency. Also, an important tactic that many brands use is paid search. I should note that we didn’t pay for Facebook, Google or LinkedIn ads, didn’t optimize for SEO, or strategically use long tail keywords, none of that. If we were to launch again, I’d definitely spend a few ad dollars and do some A/B testing with our titles and research SEO keywords. Pulling this all together, the cleanest way to build your one-man-brand is to build a website – www.yourname.com – and, in addition to posting your content on LinkedIn from your LinkedIn page, also post to LinkedIn and Twitter via your website (not on the same day as the original post) so that when readers click on the article they’re brought to your website where you have an email capture pop-up offering them the chance to get some enticing free content that is in your niche (listicles, although commonplace, are a tried and true method for this inducement). Once you have their email address, you can commence with something like the email strategy mentioned in the beginning of this section. Other tactics I would consider are niche websites/blogs (submarket and/or industry specific) with an email newsletter and email gathering function, a podcast (similar to the reason for YouTube video success – less crowded market), and continuing to make a conscious effort to grow your text and email lists. If you’ve made it this far, you probably realize that creating content to build your brand and then squeezing everything out of that content is a job in and of itself. But don’t let that dissuade you. Start with the 10-steps and repeat on a monthly basis. Before you know it, you’ll have a bank of content that you will repurpose, giving life to even more content. Content that you can point prospects too. Content that can work for you while you sleep. And, content that can open up doors for you that didn’t used to exist. I’ll leave the hardest part up to you: making commercial real estate something one would want to read about!